The contrast colour for the sleeves will be Bordeaux – I had originally planned to make the body with Bordeaux and use Fired Brick (red) for the sleeves, but then they arrived and I found there wasn’t a strong enough contrast between the two. So, the Fired Brick is still sitting there waiting for something else – I’m tempted (once I finish this and a few other things, ahahaha) to order some of the Ballerina shade and make myself a pink-and-red Ribbi Cardi. It could either be really really cutesy and cheezy or bright and sporty. Hm. Lovely! Your knitting looks so even! Try as I might mine never seems that way. Looking good. Those colours look really nice together. I’m looking forward to seeing the finished item. 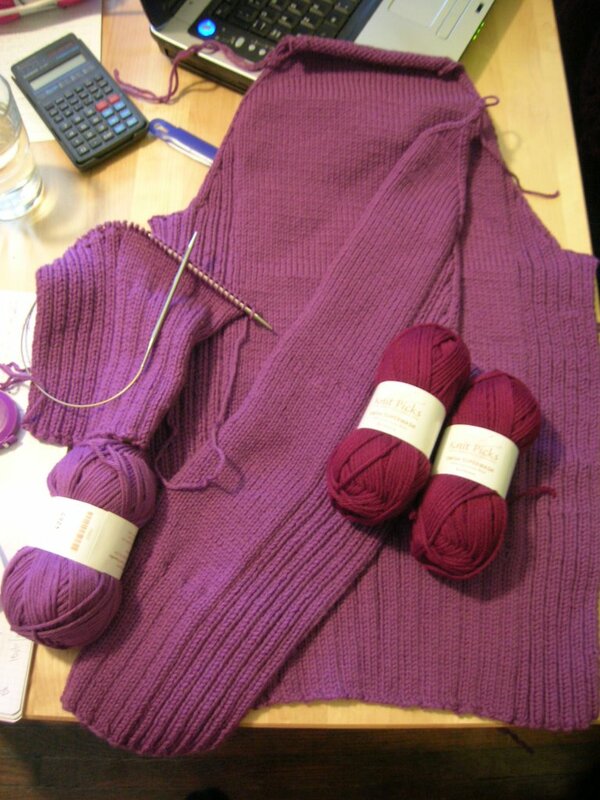 Moggle – Thank you, I’m really happy with these colours, too, it’s going to be so hard to part with the finished sweater. And I can’t wait to get it done.